Fluke - large Humpback Whale Fluke- Megaptera Novaeangliae at sunset. 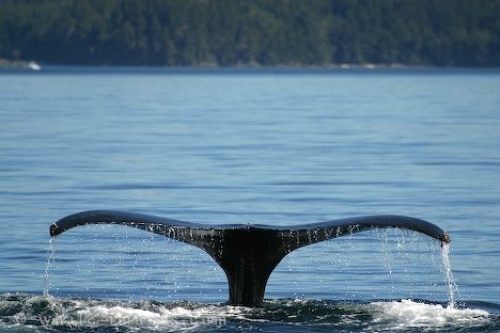 This humpback tail fluke was shot on a bright and sunny day in Johnstone Strait British Columbia. I was at the best angle to get the picture with the water falling from the back edge of the tail fluke and the way the light has caught the foaming water at the place where the whale dove, giving a real sense of the slow and graceful movements of these great sea animals. I also take those shots of the fluke for the ID Program of Humpback Whales. Picture of a Humpback Whale Fluke with dripping water.